Вести.Ru: Sparks Fly at Energy Forum: Why Does Russia Blame US For High Oil and Gas Prices? Why does Europe prefer Russian gas over American? How does the United States unwittingly raise oil prices? And why does Vladimir Putin think it would be a good thing if other countries imposed as many sanctions on Russia as possible? These were some of the questions the president addressed today in Moscow, during a session held as part of the Russian Energy Week. The main points of discussion were the global economy and hence global politics. In addition, those who determine the global stock market indexes also discussed the Skripal case, the crisis in oil-rich Venezuela, and the future of Syria after the fall of ISIS. Here's Dmitry Petrov with the details. Meetings like this one bring together representatives of the largest energy companies in the world, giving them a chance to discuss the most pressing issues. These are the meetings that decide stock market prices and radically change entire industries. Oil prices have been growing steadily for 1.5 months now. The price of Brent crude is just under $85 a barrel. And there's more than economic reasons to it. Vladimir Putin: "Let's be frank, to an extent, such oil prices are the result of the activities of the US administration. I'm talking about sanctions against Iran, political problems in Venezuela... Just look at what's happening in Libya? The country is destroyed. The US president and I had a very good meeting earlier in Helsinki. But had this issue been raised, I would have told him: Donald, if you want to know who's to blame for the increase in prices, you should look in the mirror. That’s the truth. Judging by the questions brought up by Ryan Chilcote, an American reporter who came to interview the president, he was more interested in political issues than economic ones. It didn't escape Putin's attention. Let's focus on the energy industry. I'd like to stay away from internal political processes and the infighting going on in the United States. It's up to you to figure it out or else we'll be accused of meddling in the domestic politics of the US again. In the meantime, the US government continues to employ economic pressure to influence the politics of other countries. However, the increase in oil prices has already made the ruble stronger. I believe that our American partners are making a colossal strategic mistake by undermining confidence in the dollar as today’s only reserve currency. They are undermining our faith in the dollar as a universal instrument and are simply biting the hand that feeds. I find it strange and astounding. But I think it's a typical mistake of any empire. People think nothing's going to happen. They think their economy is so powerful, strong, and stable that there won't be any repercussions. No, they will come, sooner or later". After a while, the president was able to steer the conversation toward energy, or rather, the political dimension of it. Putin was asked why Europe should buy Russian gas when there's an alternative: American liquefied natural gas. 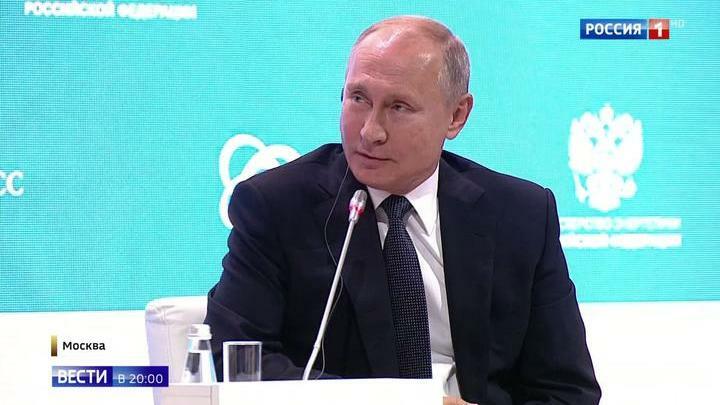 Vladimir Putin: "Please note that Nord Stream 2 is entirely a for-profit project which was warranted by rising energy consumption, including in Europe, and the decrease in domestic production in European countries. They have to get it from somewhere. The share of Russian gas on the European market is about 34%. Is this a lot or a little? It's more than a little, but not enough for a monopoly. Europe certainly can and does actually buy gas from other suppliers. But the cost of American liquefied gas is about 30% higher than the cost of the gas transported via our pipelines to the European market. It's 30% higher. If you were to choose between two products of the same quality, one of which cost 30% more than the other, which would you buy? The answer is clear". Ben van Beurden, CEO of Royal Dutch Shell: "And I would also agree with President Putin in that the difference in gas prices shows that Russia offers some of the most competitive prices. However, we should take into account the current situation. If the United States imposes sanctions on the project, what choice will I be left with? I'll have nothing to philosophize about and will have to withdraw from the project". - President Putin, would you like to comment? Vladimir Putin: "We understand everything. We understand the reality. We're implementing the project on our own. We don't have any problems here. Well, there can be some problems indeed, but we'll solve them. There are things that are above the political gambling". The existence of Sabetta confirms that Moscow is right. It's a northern port on the shores of the harsh Kara Sea. There's a plant for the liquefaction of natural gas nearby to which hundreds of gas pipelines stretch from the Yamal fields. In the difficult conditions of permafrost and the Arctic, it was built from scratch in the space of a few months. Sabetta was opened less than a year ago in a polar night. European investors flew to Yamal. They were neither afraid of the harsh conditions (it was -40) nor of the American sanctions. The cynicism of the situation is that, by using sanctions, Washington is trying to force out competitors. Judging by the latest statements, they aren't going to refuse the approach. - I couldn't help but remember Russia has faced sanctions as well. Vladimir Putin: "Did you use the past tense or the translation was inexact? Faced? Have the sanctions been canceled, maybe I missed something? - Is facing. Present tense. Vladimir Putin: "Oh, I see. Okay. It's the present tense. You know, sometimes I think it would be good for us if everyone who wanted to impose sanctions would impose all of them and as soon as possible. It would set us loose to protect our national interests by the means which we consider most effective. But generally, it's very harmful. It's harmful to those who are doing it". One of the most egregious reasons for the sanction pressure is the Skripal case. Syria is the place where Russia and the USA could join forces to fight terrorism. But Washington continues to adhere to its own interests. Vladimir Putin: We proceeded from the fact that we, nevertheless, cooperate in Syria with our American partners in the fight against terrorism, in the fight against ISIS. But as ISIS is ceasing to exist in Syria, any other explanation, even beyond international law, doesn't even exist at all. What, in my opinion, can be done, and to which we should all strive toward? We should strive to ensure that there are no troops in Syria from third-party countries at all. We should move towards this. - Including Russia, if it's approved at the level of the government of the Syrian Arab Republic. - What do you want to see at the next election? - Are you talking about the Russian or US elections? What are you asking about? - What would you like to happen in the US election? - I want... I'm saying absolutely seriously, I want the obscurantism to end related to the alleged Russian interference in an election campaign in the US. I want the American elite to finally calm down. I want them to work things out with each other. I want there to be an equilibrium and balance, just like on the oil market, the balance of common sense and national interests. I want their domestic squabbles to not poison Russian-American relations and to not affect the global situation. Concluding the discussion, the Russian president proposed to get away from various contradictions, from attempts to solve them with unacceptable tools, beyond the framework of international law, to strengthen the main role of the United Nations and move forward on the base. Dmitry Petrov, Irina Vinogradova, Lyubov Miloradova, Natalia Lundovskaya, Pyotr Mamochkin, Vesti.